Do you spend large chunks of your time reading, writing and replying to emails? If you work in a large organization, chances are your inbox is reeling under a deluge of email. Going through all this email is a waste of valuable time; time you’d rather dedicate to other more productive pursuits. 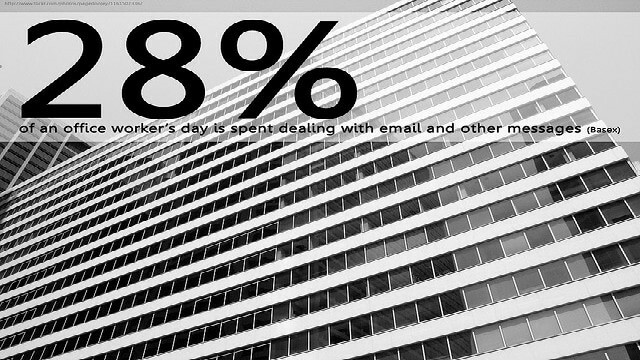 Most of us receive several dozen emails per day on average, some of which are important and some less so. The key to dealing with an email overload is giving most of your time to the important emails. Here are 5 great ways to doing away with an email excess and get more productive that way. The first thing you need to do to reduce the email deluge is sort your emails. Gmail has a great primary inbox system with a highlight feature that you can use to read high-priority emails first. Other email services also have some pretty nifty features to help you sort your emails. For example, you can use labels to automatically filter incoming emails into different categories. This way, you can keep work emails in the work section and your other emails in a separate section. Star important messages and delete the rest. YouTube, Facebook, Twitter, and other social networking sites probably send dozens of notifications to your inbox every single day. You have also probably subscribed to several newsletters that you don’t bother reading or don’t ever remember signing up for. All this translates to more emails than you can handle. If you absolutely need social networking notifications delivered to your inbox, try to reduce their frequency to once in a day. Otherwise, unsubscribe to everything. Be honest – do you really need that fitness newsletter you’ve never opened even once? You’ll be surprised at the kind of difference an uncluttered, clean inbox can make. A few years ago, if you needed to find an important email in your inbox, you had to do it manually by trudging through hundreds of emails. These days, luckily, you can use the search bar to find the emails you’re looking for. If your inbox is flooded and you can’t find that important email your boss sent you, use the search function. In Gmail, you can search for both sent and received email automatically with the search feature. Needless to say, you will have a lot more time at the end of the day if you use it often. You can also use the search function to search for a keyword or topic you no longer need in your inbox and delete those email with impunity. You’d be surprised to see how drastically it reduces the number of unread emails in your inbox. You don’t have to reply to each and every email that you get. Also, you don’t have to reply to every email immediately either. Reply to urgent emails quickly and junk the rest – or reply to them later. According to research, you spend twice as much time replying to emails as compared to sending them. Unless it’s a formal email you absolutely have to reply to properly, compose a new email (from memory), and send it, instead of laboriously composing and sending line by line replies. And, finally, the best way to avoid getting overwhelmed by all those emails is to limit the time you spend checking them. This may sound like an unnecessary tip, but really, do you need to check your email on your computer, laptop, your smartphone and your tablet every chance you get? Limit the devices you check your emails from. Also, try to allot a time-span of 30 minutes to an hour at the most, spread throughout the day, for checking your emails. Don’t go over the same email(s) more than a couple of times, if you can help it. You don’t have to micro-manage your email time, of course. Just try to cut back on the email checking a little and free up some time for yourself. Hopefully, these 5 easy tips will help you save time and be more productive at work or in the course of your daily life. If you have thousands of unread emails, we know sorting through them will be a nightmare. There are apps like Sanebox out there which can certainly lend a hand. If that hasn’t helped, we recommend you get a new email account and start over and be more organized this time!